Last month we told you about Norwegian Cruise Line trying out a package that’s an add-on to any cruise they have (except on Pride of America) that makes it nearly all-inclusive. At the time Norwegian launched it, it was being sold through August 31 for 2015 sailings. Today the line has extended the deadline for purchasing it through September 30. 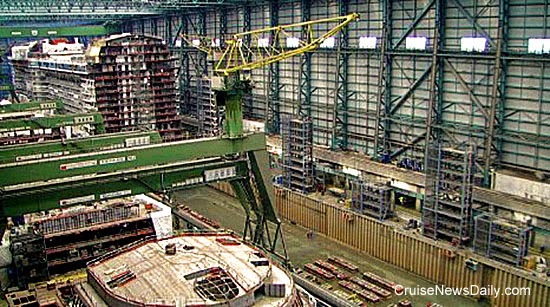 We hope you haven’t overdosed on Quantum of the Seas information, because Meyer Werft has produced their own video of last week’s float out. It includes lots of behind-the-scenes that you won’t see in other videos. We put it on our blog below. Meyer Weft floated out Royal Caribbean's Quantum of the Seas last week, and there are lots of videos and photos out there. But Meyer has now produced their own, so of course, it includes a lot of behind-the-scenes that you won't see elsewhere. Cruise business will be booming in Guadeloupe this winter, but not with Americans. We noticed a repositioning cruise this fall aboard MSC Magnifica with a killer itinerary. It’s a 20-day trip from Hamburg to Buenos Aries, so it won’t interest many of our readers, but there was a shore excursion that also caught our attention that we’d like to see more of. * Seattle Traffic DownAs the cruise season winds down, the port of Seattle has revised its cruise passenger figures downward. It seems to be a trend from 2012 to 2013 and now 2014. As cruisers in any given market get experience, they begin to look for variety. The standard seven-night cruise is nice to have in a market because you know it’s going to be there any time you want it, and it’s going to fit perfectly into that week you have off. The down side is that after you take it a couple of times, you want some variety; you want to go different places. The problem is that from most home ports, there’s a limited number of ports you can reach in a week. Carnival has accommodated this desire for variety in the Baltimore market by today announcing an array of different itineraries of differing lengths to several destinations for the winter 2015-2016 season. It’s so varied that there are only a few of the “standard” seven-night sailings left. Five years ago, with lots of fanfare, the switch was flipped at the port in Vancouver and shore power was made available to visiting cruise ships. Much was made of the fact that Vancouver was the first port in Canada to offer the service which would substantially reduce pollutants coming form idling cruise ships and improve life around the port. A funny thing has happened over the last five years. Despite offering financial incentives for cruise lines to equip their ship and use it, only a minority does, and the folks in Vancouver are unhappy after making such a substantial investment. CND subscribers also read about the price of everything increases ... and the pretty sisters. This article, written by Michael Gallagher, public relations executive and historian for Cunard Line, is part of an ongoing series of key moments in Cunard Line's history. 19 August 2014 – As the 20th Century dawned, Cunard Line began to draw up initial plans for what would become the first-ever “superliners,” Lusitania and Mauretania, which would enter service in 1907. But how would the future superliners, the largest and fastest ships in the world, be powered? There were two options for Cunard to consider: the standard quadruple-expansion system or the new-fangled Parsons steam turbine system. Engineer Charles Parsons had caused controversy at the 1897 Spithead Naval Review by demonstrating his revolutionary turbine-powered Turbinia. At the same time, Cunard's German rivals were eclipsing its fleet so, in a bid to reclaim its tarnished pride, Cunard convinced the British Government to provide a generous loan package to rebuild its fleet in return for the ships being made available to the government in time of war. This is how Cunard would finance all of its major newbuilds right up to QE2, and every loan was repaid. With financing in place, Cunard was able to embark on an ambitious shipbuilding programme that would result in Lusitania and Mauretania. But first would come the twins, Caronia and Carmania, and it was those two ships that would resolve Cunard's superliner powerplant quandary, as they would be used as floating test beds. To ensure all things would be equal, both ships would be built at the same shipyard, John Brown & Co. in Clydebank, but Caronia received the standard quadruple-expansion system while Carmania got the Parsons steam turbine system. The performance of each ship would be carefully studied and evaluated and the most efficient plant would be put into the future superliners. When they entered service in February 1905 (Caronia) and December 1905 (Carmania), they were the largest Cunard ships ever built and the first Cunard ships to be fitted with bridge controlled watertight doors. They quickly became known as the “Pretty Sisters” and it was Carmania's steam turbine engines (which achieved 20.04 knots compared to 19.62 knots on Caronia) that proved to be faster and more economical. Steam turbines would be used on every important ship right up to QE2 in the 1960s! So two ships that were built to experiment with and solve an important issue would have a major influence on future Cunarders, and each “Pretty Sister” would also enjoy successful careers. 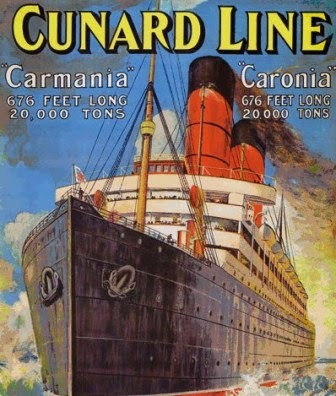 Caronia was employed on the Liverpool to New York via Queenstown service and was sent cruising in the Mediterranean in the winter months. In the First World War, she became a troopship before returning to normal service in 1918. Subsequent years would see her on various routes across the Atlantic: from Hamburg and Southampton to New York; Liverpool to Quebec and Montreal; Liverpool to Boston and New York; and finally London to Southampton to New York, with winter cruising from New York to Cuba. Caronia was eventually laid up in 1931 and sold in 1932 for £20,000 to UK shipbreakers, who sold her on for £39,000 to Japanese shipbreakers. She sailed to Japan with the name Taiseiyo Maru, “The Great Oceanship”. Carmania operated on the same route as her sister. She was requisitioned as an armed merchant cruiser and on 15 August 1914 – just days after the declaration of war – she met and engaged in battle the German Hamburg South America Line's Cap Trafalgar, which was similarly armed, off the Brazilian island of Trinidad in the South Atlantic. Amazingly, Cap Trafalgar's exterior had been altered, with the removal of her third funnel and the repainting in Cunard colours of her remaining two funnels, for her to resemble Carmania! After opening fire simultaneously at a range of around three miles, the two ships closed to within 1,700 yards. During the two-hour engagement, Carmania received over 79 hits and was ablaze from bridge to stern. Cap Trafalgar had been hit near the waterline and, after listing, sank. The German raider Kronprinz Wilhelm was approaching to come to the aid of her consort, but Carmania made her escape. The battle was the only time an armed merchant cruiser ever sank a similarly outfitted merchant vessel. Carmania was decommissioned in 1916 and after the war continued to sail the Atlantic like her sister before being broken up in Blyth in 1932. Image courtesy of Cunard line. All rights reserved. May not be copied or used without permission. It was just a few years ago, faced with high taxes and onerous rules, cruise lines began slowly reducing capacity in Alaska, something Alaskans didn’t think would happen when they enacted the measures the cruise lines didn’t like. Visitor numbers began to plummet, and the state began feeling the economic impact. As the governmental leaders were replaced with more forward thinking ones, they began to work with the cruise lines to reverse the trend. Cruise lines began to return some capacity, and a few weeks ago with last year’s figures in (the year ends just as this year’s tourism season starts in April), the state announced visitors to the state reached an all-time high. A crew member went overboard from Royal Caribbean’s Independence of the Seas last week, and he wasn’t discovered missing for hours. CND subscribers also read about how it must be catching ... they're getting ready to fly ... and ready for the next one. The building dock at Meyer Werft today showing Anthem of the Seas under construction. 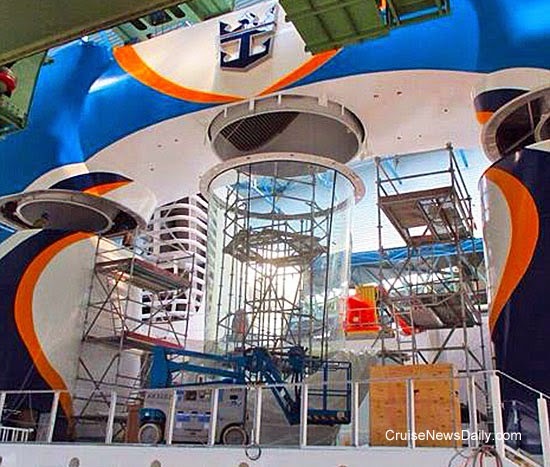 One of the unique new features aboard Quantum of the Seas is the Ripcord sykdiving simulator by iFLY. Like the rest of the ship, it’s in the final stages of being readied for delivery. Photo courtesy for Royal Caribbean International. All rights reserved. May not be copied or used without permission.